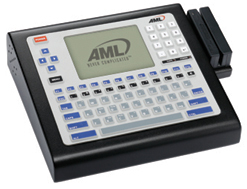 The AML M7140 is a programmable stationary terminal for fixed station, wired, or wireless industrial data collection applications. Engineered for price performance, yet offering powerful features and extensive flexibility enhancements, the M7140 is an ideal solution for work-in-process tracking, shop floor control, and factory automation in manufacturing, distribution, and warehousing applications. The M7140 Stationary Terminal is extremely flexible and offers a broad range of connectivity and I/O interfaces to support most data collection requirements. Each M7140 ships standard with a powerful Intel StrongARM processor, Compact Flash Card Slot, and 10 Base T Ethernet connectivity. Extensive I/O interfaces include two RS-232 ports for bar code scanners or other serial devices, three optically isolated inputs, and three relay contact outputs for integration with PLCs, conveyors, scales, and alarm devices. The M7140 Stationary Terminal is built tough to withstand shop floor conditions and sports a rugged powder-coated steel enclosure, 77-key elastomeric keypad, a ¼ VGA backlit LCD display, and an internal speaker. 32MB DRAM memory, 16MB Flash ROM, and compact Flash storage up to 512MB provide adequate storage for all your program and data file storage. As a member of the AML M7000 Series of data collection terminals, the M7140 Stationary Terminal integrates into a wide range of computing environments to help reduce the time and costs associated with application development. Each M7140 ships pre-loaded with VT100/VT220 terminal emulation, a native TN5250 client, FTP server, HTTP server, TELNET client, Web Browser, WEP and WPA/WPA2 advanced encryption and authentication capabilities. Available with optional magnetic stripe reader or slot reader.